These GI Clovers have had a busy first year. They have been working since last October on Sewing, Cooking, Shopping, Speaking and Home Environment skills. The GI Clovers initial public success came when one of their members won the PSA contest and received a trophy for their poetry presentation at the speech contest. That got the rest of the members excited. At pre-fair activities, another one of their members won the Championship Trophy at the Bicycle Road-e-o. When the fashion show came around, the three girls from their club who entered, each won a modeling award: the $75 modeling outfit, the Challenge Outfit, and Beginning Clothing. The extension agent noted that some girls work all their years to get on that stage, and all three of their girls got a Rosette. During the County Fair, the girls did exceptionally well, qualifying several things for the state fair. Most importantly, their display explaining their service project was chosen for the Nebraska State Fair. The project was called “4-H Superheroes.” Their leader, Samantha Hubbard, had known Jet Hansen, a little boy from Grand Island who suffered from Pulmonary Vein Stenosis, and who had received a lung transplant. He passed away on March 3, 2013, a month shy of his third birthday. Samantha asked the club in May if they would be interested in a service project to make superhero capes to donate to “Sew to Soar,” which was organized by Jet’s mom, Sarah, and their family and friends, including Samantha, in order to honor Jet’s memory because he loved superheroes. They thought the idea was a great way for them to use their first year sewing skills. As a group, the GI Clovers have donated over 25 capes, affecting at least 25 children and their families. Each cape takes about an hour and a half to cut and sew, so they have donated 35-40 hours to this project. It helps them feel like they are truly using the skills they have learned in 4-H. The GI Clovers plan to continue this service project. Their goal is for each of them to make 10 more capes for a Christmas delivery to Children’s Hospital in St. Louis, where Jet received his lungs. 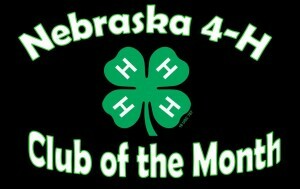 The Nebraska 4-H Foundation and Nebraska 4-H Ambassadors are proud to call the GI Clovers 4-H Club of the Month for August 2013. No Comments to "GI Clovers – August 2013 Club of the Month"